I love Facebook, and I especially love our Facebook Followers. I get much enjoyment out of social media. From our Facebook page I get to interact with some mighty fine folks always willing to help. And on my personal page I get to keep up with my family and our grandbabies and lots of friends. You know, stories about what they’re doing, the fun they’re having, etc. But sometimes my social media newsfeed is filled with half-truths being touted as true. It frustrates me to no end! I’ve been very open about my feeling that everyone has the right to feel the way they do. Not everyone feels like me, and I’ll probably not have the same opinions as everyone else either. And that’s OK! But the thing that bothers me is someone hearing a story purposely tilted by friends or the media and then taking the ball & running with it. They get busy spreading the rumor themselves feeling there must have been a gross injustice done. But just because you read about it online (or even hear about it from a friend or family member) doesn’t make it true! I’d like to share a real-life example with you why snap judgements about a situation might not be as it appears. A couple of years ago friends of ours called frantically. Their heifer had apparently gone into labor early and was having difficulty calving. They were relatively new to raising cattle and called us for advice. RancherMan & I flew into action. We gathered the tools we felt we’d need to help deliver the calf and raced to their fledgling ranch nearby. When we arrived we found the heifer in a small grove of trees. She was indeed in trouble. But something looked very wrong to us, things just didn’t add up to it being her calving time. She’s a heifer so she’d never given birth before. But even so it appears she had no milk at all, her udders weren’t filled even a little. And she wasn’t springing either. And WOW does she look tremendously bloated! So RancherMan & I assessed the situation & decided relieving that bloat had to be the first thing accomplished. We tried to tube her, to no avail – the tube went in fine but there was no pressure release at all. Hummm… We worked on her for about 45 minutes before I stood and looked my friend in the eyes. But frantic phone calls had already proved that there were no vets available for an emergency onsite ranch visit. So it was up to us to save this heifer. We’d need to get her loaded up & to a vet STAT! Do What You’ve GOT To Do! Her hubby ran for the trailer and backed it up as close to that heifer as he could. But since she was down in a grove of trees he could only get so close. How will we get her onto the trailer? She couldn’t walk or even get up. Heck she was so bloated, even laying where she was her back feet couldn’t touch! After a little discussion we started figuring the best course of action for getting her moved. Time was of the essence! We got a come-along and chained it to the trailer, then attached ropes & chains until it was long enough to reach the cow. We attached that end to the cow. Then as gently as we possibly could we inched her toward the mouth of the trailer. We were concerned about getting her up onto the trailer floor, but we knew she’d die if we didn’t get help for her soon. It was ugly let me tell ya, and I’ll spare your tender hearts the details of it all. But after much effort from all of us we finally got her loaded up. I told our friend that we’d follow them to the vet and we all sped off. When we got to the vet’s office the cow was still down, and still dangerously bloated. The vets were shocked at her appearance & worked on her right there in the trailer as long as they could trying to get the calf out. I took my friend aside and explained what was about to happen, trying to shield her from witnessing the procedure. In the end they found that there was not one, but two calves inside the heifer. They were both dead and had been for a while. 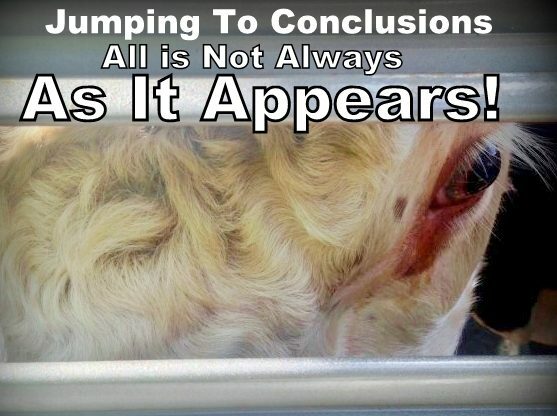 The cow wasn’t going into labor, her body was attempting to abort the dead calves. The ‘bloating’ we were seeing was actually not bloat at all, but gasses resulting from decaying calves inside her. Poor girl! Now if someone had been videoing our heroic efforts to get this heifer loaded into the trailer it would have looked shocking to an outsider. Especially to someone who did not know about raising cattle. And certainly to someone who did not understand the gravity of the situation. It would have looked like abuse. It would have looked like a callous disregard for this this poor animal. But as it turned out, it was the only thing that saved her life. If we hadn’t gotten her to the vet right then she would have died too, but only after much agony. This beloved heifer would never have gotten another chance to breed, another chance to roam the pastures. She’d never get the chance to live the blissful ‘cow life’ our friends would have assured for her. As it turned out our friends diligently nursed her back to health. After several months of healing they placed her with their bull and she successfully bred. HOORAY! She’s never had a problem since and she’s calved several times since that awful day. How wonderful for my friends to look out into their pasture and see that favored cow peacefully grazing with her newest baby beside her. But this situation illustrates my point perfectly. If a family member or friend of yours described our actions to you, it would have sounded horrible. Even if you’d seen it with your own eyes on VIDEO it doesn’t mean you know the whole story. What you’re being told or seeing on video could be very easily misinterpreted. But this is a good reminder for all of us. Be sure to check things out for yourself before plastering a part-story character assassination of someone else on social media. Of course you have the right to like or not like another’s actions. But get all the facts before you decide how you feel about it or pass on that half-truth juicy gossip about someone in your community. Please, please, PLEASE! Research for yourself before you jump on the bandwagon & spread false malice about someone else. You may very well be just as guilty of character assassination as the person who started the rumors in the first place. Always remember – not ALL is as it appears! 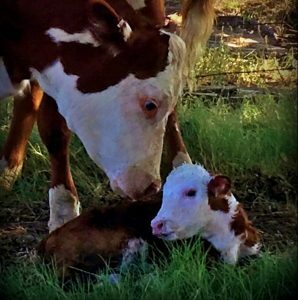 This entry was posted in Blog Posts and tagged Calves, Rants on September 17, 2017 by Texas Homesteader. I understand exactly what you are saying–it drives me NUTS when folks join in on a ‘discussion’ and take sides when they don’t have a clue as to what is really happening. One other thing that makes me nuts on Facebook is when people repost stories without even trying to check the facts. For crying out loud, it takes literally seconds to research if something is true or not. If I read ONE MORE POST that Facebook will start charging if you don’t repost, cut and paste, or stand on your head and stack BBs, I may scream. I have volunteered for over 25 yrs with animal rescue and if anyone thinks that taking an animal away from it’s owner is an easy feat they’re sadly mistaken. ( This was not directed @ Tammy’s cow, just a general statement) I have been in court more times than I can count on, on behalf of an abused animal and I mean abused! Whether it’s a dog that could barely stand up because he was so full of ticks he was anemic, 40 pounds under weight and the collar that was embedded in his neck was still there ripping his hanging skin. Or the horse that had his legs chained sawed off while he was still alive because the owner was “tired of him getting out of his pen”. Like the ASPCA, or any other animal welfare group you will have good and bad just as you do with animal owners. When I hear that the “little rescues” are pushed aside because of ones like the ASPCA I wish those people would do their research first. Some of those little rescues are not licensed to go into certain situations and can make matters worse. Many of those smaller rescues are made up of volunteers who have no formal training regarding state laws and regulations. (Their services are greatly needed and appreciated!!) Do people have a problem with people like me probably and I don’t care!! I’m a Vet Tech who could make money at this and choose to donate my time for the ones who have no voice! Tammy’s post hit home because as she knows there is 2 sides to every story and it goes both ways. I hope people do their research before they donate to any charity. I can tell you that from my experience that most animal welfare groups are there for the animals who have no voice!! Tammy , you saved a life, If it wasn’t for you that cow would have died a very painful death!! Thank you!! I think the media is at fault for a large part of the problems happening today. I can’t remember who said it but I think it is: Believe half of what you see and none of what you read. As long as we are talking about this . . . I have cancelled several blogs because they got so political and not in a nice way. I subscribe to blogs to learn about decorating, cooking, gardening, etc. etc. etc. NOT political rants. Kind of like the one I just gave. Sorry but thanks for reading. Very well said! Do your remember the days when the media reported facts, not opinions? I’m glad the heifer is okay! I love your blog! Amen! You can thank today’s media for this. Their morbid drive for ratings and the almighty dollar is the reason you only see what they want you to see. The ASPCA is just as bad with their god like attitude that no other organization is as good as they are when in fact they are also just about the money. The saddest part is there is no one to monitor these groups. They run uncontrolled showing, saying and doing what ever they want, many times destroying a smaller organization using the exact same tactics you wrote about. Only a little over half of ASPCA donations actually go to animal welfare, the rest is overhead, salaries and advertising. Thanks for having the courage to write this article. The mass public has no idea what the working rancher does to care for their animals. I wonder how these groups would react if the tables were turned?